Many people use social media platforms like Facebook, Instagram, and Twitter to keep their friends, family, and followers up to date with their lives. However, if you are in the middle of a personal injury claim following a car accident or other type of incident, you need to be careful about what you post. Something seemingly innocuous can lead to losing your personal injury case or not receiving the full compensation you deserve for your injuries. Even those who have social media pages set to ‘private’ should follow the guidelines we will discuss below. In this day and age, you never know who can truly see your social media profiles. Let’s say that you were stopped at a red light. A distracted driver rear-ends you, causing injuries. There is no question about who is at fault. The only question is how much compensation will you receive. Your car accident lawyer puts together a case based on the information you provide. You are experiencing chronic pain and can hardly perform daily tasks. You claim that even getting in and out of the house is difficult. Now, let’s say you had a family vacation planned long before your car accident. Maybe you already know you shouldn’t be posting about your accident on social media, but surely you can continue to post about your personal life, right? So, you head to the beach with your family. Perhaps you are truly in pain the entire time and have to sit out of many activities. Still, you post some smiling pictures of yourself enjoying the great outdoors. You’re soaking up the sun on the beach, you’re riding in a boat, and maybe you’re even casting a fishing rod. Do the defense’s lawyers, you don’t look very injured. In fact, you look like you are fully enjoying life and are not experiencing any of this “pain and suffering” you are claiming. Social media doesn’t give the full picture, especially because many people would rather make posts about the fun events they enjoy rather than physical therapy sessions and all the hours spent in the hotel room while your family goes on outings. A defendant will use these happy pictures and posts to their benefit, even if they do not depict the entire situation accurately. While an experienced car accident lawyer will refute these claims with more proper evidence, there is no way to know how jurors or a judge will react. At the end of the day, it is best to stay off of social media entirely until your case is resolved. Information about your injuries, the accident, or medical diagnoses. If this doesn’t line up exactly with what you’ve told the insurance agency or investigators, it can backfire on you and make your store seem less credible. Grievances you have with the defense. Your car accident attorney is fighting hard to recover compensation for your injuries and pain and suffering. If you make social media posts “trashing” the defense or their insurance company, these can be seen as personal attacks and negatively impact your case. Details of discussions with any lawyers, insurance companies, or other parties involved. This information may be confidential and posting details about your interaction with these entities can lead to a breach of protocol. The above are things that you definitely shouldn’t post about on social media, and they are likely pretty obvious. But there are also a few grey areas you should be careful about as well, especially if you are claiming to have pain and suffering as a result of your car accident. Posting photos or descriptions of you being very active. This can be seen by the defense of you not being as injured as you claim to be. “Checking in” regularly at places that might not line up with your claims of pain and suffering, including the gym, amusement parks, or other areas that require physical activity. Even checking in at non-activity based places like stores or restaurants can affect your case if you are claiming to be houseridden. Being tagged in photos with friends. The nature of social media allows your friends to tag you during a night out or physical activity. Consider adjusting your settings so that you have to approve any tags before they connect to your profile. When you call Alex R. Hernandez Jr. PLLC to discuss your car accident injuries, you can also discuss how your social media presence should be handled throughout the case. 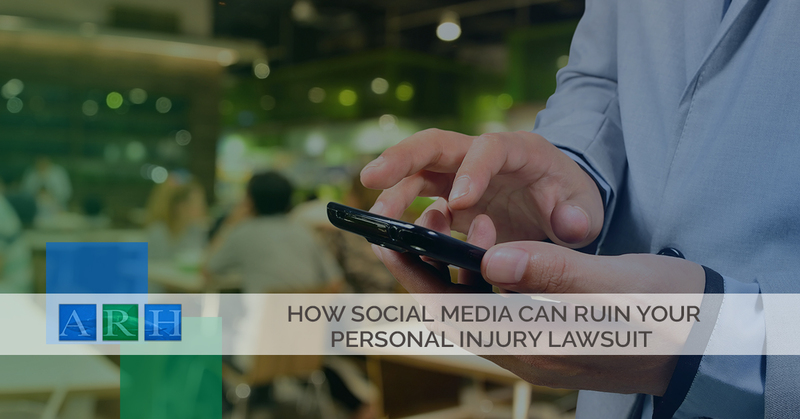 Depending on the severity of the case, your attorney might advise you to disable your social media accounts entirely or might set a few recommended guidelines. If you have been injured in a car accident, be sure to contact a car accident lawyer before turning to social media. Anything you post after your accident can affect your case in a negative way and possibly cost you the compensation that you deserve. Get in touch with the legal experts at Alex R. Hernandez Jr. PLLC to start work on your personal injury lawsuit.